With its scandalous past and a cameo in Pixar's classic Toy Story 2, the Cherner Chair is certainly a design icon worth getting to know. We're often using the word 'timeless', but this isn't a word we just like to throw around. A timeless design is one that ticks multiple boxes — its appearance will outlive any trends, it'll last for generations to come thanks to its exceptional quality and it has gained a level of status and recognition that will only continue to strengthen its reliability. The iconic Cherner Chair by Norman Cherner is certainly one of these designs. Mention the word plywood and there are 3 iconic designers we immediately think of — Charles and Ray Eames and Norman Cherner himself. 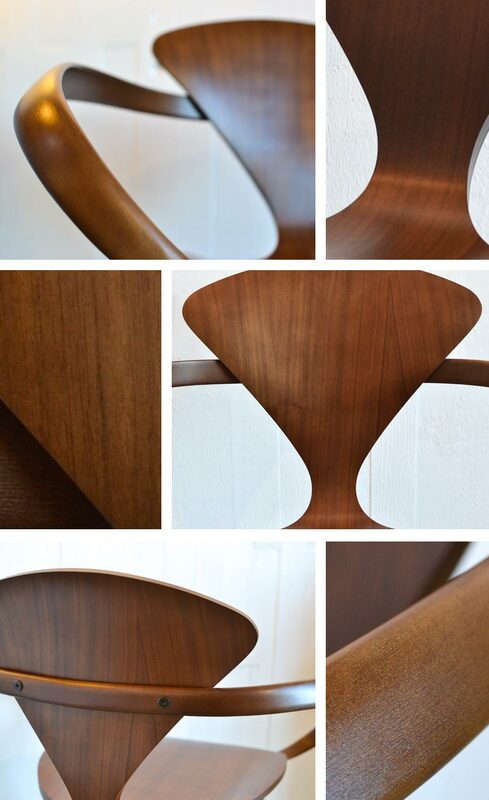 Made entirely in the USA, the Cherner Chair is one of the most elegant and sculptural chair designs of all time. Moulded and hand-assembled from sustainably-sourced plywood, the structure is formed from graduated thicknesses and smooth curves, resulting in its unique, wasp-waisted form. Not only are these swooping curves beautiful, but they also make the chair incredibly strong and robust — you won't ever find yourself throwing a Cherner Chair into a skip, that's for sure. The Cherner Side Chair is available in Classic Walnut, Ebony and Stella orange, whilst the Cherner Armchair is available in Classic Walnut, Natural Beech and Ebony variations — plenty of options for every home. Unfortunately for Norman Cherner, it wasn't all fun and games when it came to the production process of his beloved Cherner Chair design. In 1957, Hermann Miller — led by revolutionary designer George Nelson — and their manufacturer Plycraft ceased production of their original Pretzel chair, as it proved to be too costly and fragile. George Nelson himself recommended that Norman Cherner should design a more reliable and cost-effective alternative, which was later accepted by Paul Goldman — the owner of Plycraft — with an official contract. L-R: The original Pretzel Chair and George Nelson. Source: 1. However, the project was quickly scrapped — or so Norman thought. He soon discovered that Goldman was replicating and selling his original chair design under the fabricated name of 'Bernardo' — a true act of deceit. This would've been a problem, if it wasn't for the fact that Norman completely turned the situation on its head; he successfully sued Plycraft and Goldman in 1961 and received the proper royalties and credit through the company. Who said karma doesn't bite? After all of that effort, it might seem a little disappointing to hear that the chair was only legally produced under Plycraft until the 1970s. However, the reason you can still buy the chair today is all thanks to Norman's sons, who continue to manufacture an official reproduction of their father's sought-after design from his old drawings since 1999. The Cherner Chair is only 1 of a handful of products that constitute the Cherner Group collection, which includes some more recent designs from Norman's son Benjamin Cherner. You can discover these products in our online collection. The Cherner Chair has certainly survived a fair few battles along the way, but they say only the strongest come out on top. If you're looking for a timeless dining set that will always have a place in your home, then we couldn't recommend the Cherner Chair enough. Its warm, humble appeal makes it a charming choice for just about any home — perfect if you love all things mid-century or high-quality wood products. Shop the full Cherner collection today. Got something to ask? Get in touch with our friendly team today by emailing info@nest.co.uk, calling 0114 243 3000 or messaging us on Live Chat.